Gastronomy education in Turkey is given under the names of “food and beverage management” and “gastronomy and culinary arts” in degree programs and “culinary” in associate degree programs. In these sections where students are active in a significant part of the educational process, the physical facilities, curriculum, lecturer, student and database dimensions are important in determining the quality of education. 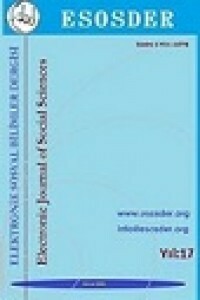 In this research, it is aimed to evaluate the quality of gastronomy education at the higher education level in Turkey. In this direction, the questionnaire method was used for data collection. These questionnaires were sent all gastronomy lecturers and the students including private universities in Turkey. 400 students and 102 academics a total of 502 questionnaires have returned and taken into consideration. The obtained data were analyzed with SPSS packet program. Analised results present very interesting findings about the quality of gastronomy education at higher education level in Turkey. It is seen that the physical facilities, databases and curriculum offered during the education in these sections do not satisfy both the academicians and the students and are not sufficient. In addition, quality of gastronomy education scores show meaningful and significant differences according to the type of university trained and the degree of education. Gustafsson, I.-B., Öström, Å., and Annett, J. (2009). Culinary Arts And Meal Science As An İnterdisciplinary University Curriculum. Culinary arts and meal science, s. 270-293. Ko, W.-H., and Chiu, Y.-H. (2011). Developing Teaching Quality Indicators For The Culinary Teacher in A University. World Transactions on Engineering and Technology Education, 9(2). Kozak, N., and Açıköz, Z. (2015). 7. Akademik Turizm Eğitimi Arama Konferansı Sonuç Raporu. T. A. Anatolia: Turizm Araştırmaları Dergisi (Dü.). içinde İstanbul: Nazmi Kozak. Kurnaz, A., Kurnaz, H. A., and Kılıç, B. (2014). Önlisans Düzeyinde Eğitim Alan Aşçılık Programı Öğrencilerinin Mesleki Tutumlarının Belirlenmesi . Muğla Sıtkı Koçman Üniversitesi Sosyal Bilimler Enstitüsü Dergisi(32), 41-61. Öney, H. (2016). Gastronomi Eğitimi Üzerine Bir Değerlendirme. Selçuk Ün. Sos. Bil. Ens. Der., s. 193-203. Temizkan, R., Cankül, D., and Kızıltaş, Ç. (2018). Food And Beverage Education and Scholars' in Turkey. Journal of Gastronomy, Hospitality, and Travel, 1(2), 18 - 25. Zahari, M. S., Jalis, M. H., Zulfifly, M. I., Radzi, S. M., and Othman, Z. (2009). Gastronomy: An Opportunity for Malaysian Culinary Educators. International Education Studies, 2(2).